There’s lots to be said when things are well done. Make that well done in French, as in just right and, so goes the aptly named BIEN CUIT bakery-cafe that you’d expect to find in the countryside of France and not in the film set that is Smith Street in Cobble Hill Brooklyn. With BIEN CUIT think more neighborhood boulangerie than patisserie even though its pastry and viennoiserie (danishes and the like) might make the carte of many a haute bakes shop in Paris’ 16th arrondissement. In a New York croissants are often confused with uninspired crescent rolls but at BIEN CUIT you’re in for a flaky buttery could-be-French standout. There’s also an amazingly satisfying chocolate twist, inventive apple cardamon danish and the tastes-like-grandma-made Bostock coffee cake. With all this goodness it’s easy to overlook the bit of disappointment that came with a spongy artichoke and goat cheese croissant and the dryish Tebirke poppy seed and almond paste union that did not make for a great bakes moment. 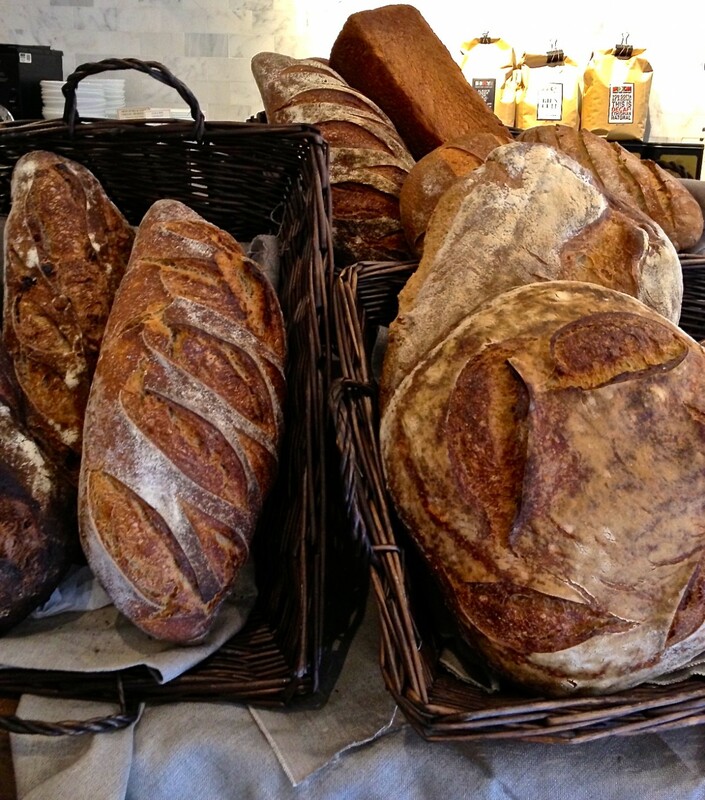 Pastry pursuer or not, the bread is why you’re at BIEN CUIT. Artisanal may be a word loosely used at markets and bakeries but at BIEN CUIT it’s right on target. Tradition in bread making plays itself out with slow fermentation that, depending on the bread, can take days for loaves to make their way into an oven and onto a cooling rack. The standard-bearer to this process is the miche, a massive sourdough disc crustily formed from a combination of wheat and rye flours fermented for up to 68 hours. From there you can try the flattened oval that is the sunflower rye, its seeds adding a richness throughout the loaf; the pain de mie, a relative of brioche incarnated into a cleanly crusted rectilinear loaf sweet and rich from honey and milk; and, a loaf imbued with olives or the sweet meets nuttiness of raisin and walnut along with a variety of petit pains (rolls). 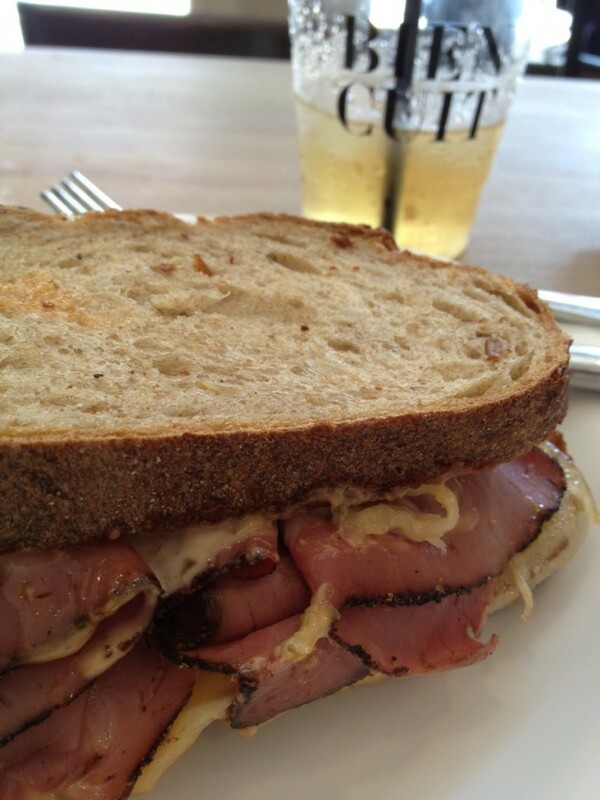 Zach puts all of this bread to good work with his beautifully composed sandwiches of locally sourced ingredients like the Reuben on sunflower rye, turkey on a croissant and ham and cheese on a baguette. C’est la vie, after all, it’s not Paris but its location makes for one charmed European-edged locale and the perfect setting for these very old-world-minded bakes and breads. Well done BIEN CUIT, well done. BIEN CUIT, 120 Smith Street, Brooklyn, NY, 11201. Tel. 718-852-0200. Open daily 7a.m.-8p.m.